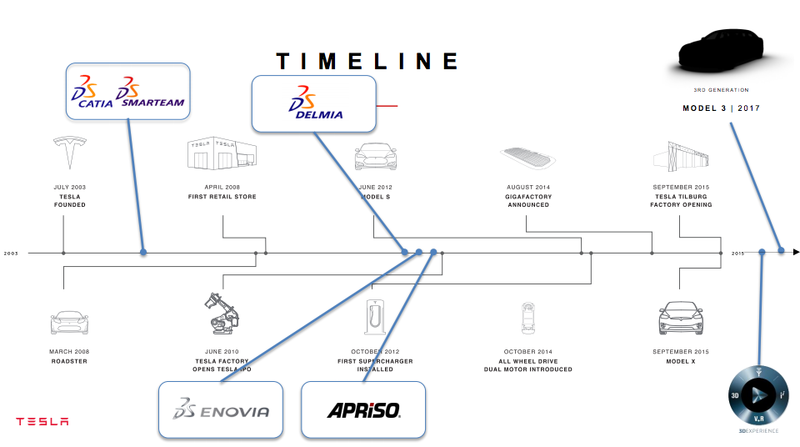 As Tesla is planning for significantly higher volume products in the near future, the Model 3 and Tesla Energy products, the company is implementing a new custom end-to-end workflow system across the organization with a focus on “product platform, engineering and manufacturing efficiency, small teams and IT”, according to a presentation by Tesla Director of Engineering Applications Paul Lomangino obtained by Electrek. The new system is called ‘Tesla 3DX’ and is based on the 3DExperience platform by the French software maker Dassault Systemes. Tesla has an unconventional history with business management software. In 2012, as Tesla was about to launch the Model S and business was growing, instead of going the conventional but costly route of implementing a trusted ERP system like SAP, CEO Elon Musk tasked his Chief Information Officer Jay Vijayan to develop in-house a custom end-to-end system fit to Tesla’s particular needs as an automaker operating its own store and service centers. The system, called Warp (like Warp Drive), became central to the company’s operations and unique business model. Vijayan reportedly built and implemented the system in just 4 months with a small team of 25 software engineers. It was built around three main factors differentiating Tesla from other automakers: selling cars online, servicing its own cars and frequent over-the-air updates. The Warp system allows Tesla to create a short feedback loop to engineers and quickly push updates back to customers. It manages everything from the ordering processing to the manufacturing workflow and supply chain management. “Elon’s vision is to build a vertically integrated organization where information flow happens seamlessly across departments and where we have a closed feedback loop to our customers. By doing this, we can provide the best possible product, service and overall experience to our customers in the fastest way possible, while also operating efficiently as a business. Now back to current days and ‘Tesla 3DX’. In a presentation titled “Tesla Motors’ Journey to 3DExperience”, Tesla Director of Engineering Applications Paul Lomangino explains why the company is updating its systems for engineering, design and manufacturing. The director writes that Tesla’s priority is to plan for significantly higher volume products, the “Model 3 and future products”, and that “Tesla 3DX” is the “solution” to make that happen. Having joined Tesla in 2006, Lomangino has been with the automaker throughout almost this entire timeline, including all the mentioned implementation of engineering and business tools. The ‘Tesla 3DX’ platform is looking to create a consolidated, fully-functional Product Structure with both computer-aided design (CAD) and bill of material (BOM) processes. While Tesla has long been a one product company, it finally started producing two different vehicles late last year, the Model S and the Model X, but it will still be a few months before both are running at full production capacity, and even once at full production capacity, we are only talking about an average of ~1,600 units per week. The upcoming Model 3, which will be unveiled next month and on the market in late 2017, as well as the stationary energy storage products under Tesla Energy, will be the company’s first mass market products to be manufactured in truly high volumes (hundreds of thousands annually). The implementation of Tesla 3DX appears to be a requisite of Tesla’s transition from being a one product company to a multiple product company to a high volume multiple product company. Tesla CTO JB Straubel confirmed last year that the automaker shifted its core focus to developing a new platform and battery architecture for the Model 3, which will be unveiled on March 31st and is expected to go on sales starting $35,000 in late 2017.